365 Days Of Trash: Isn't About Time To Give Up On Plastic Water Bottles? Isn't About Time To Give Up On Plastic Water Bottles? I'm kind of shocked that with all of the info out there, people still continue to use plastic water bottles. I've asked around and the two main reasons I hear are that it's cheap and it's readily available. Cheap- OK, I may be cheap, but water bottles are not. Let's say that i drink 3 bottles worth of water every day 300 days out of the year. At $1 a bottle (averaging a bit) that's $900 a year out of my pocket. On the flip side, here in Los Angeles, the same amount of water out of my tap will cost me about $1 from the city. So the cheap thing doesn't really add up. A good metal water bottle will run you $15 or so, but will last about 10 years or more, so that won't put it over the top either. Even if you are one of those folks who thinks your tap water is not good, and want a filter for your house, you're still talking about less than $1 a day. Bottom line is that tap water is cheaper. Readily Available - Here in the US there is excellent drinking water almost everywhere you go. We've got running taps in houses, businesses, public places and at the beach. In fact, there is water many places (your house) that bottles will never be sold at. So the idea that it is easier to grab a plastic bottle than grabbing your aluminum water bottle is truly ridiculous especially since there are so many places to fill them up. Now let's look at what drinking out of plastic bottles have going against them. Most bottled water is not regulated (meaning you don't know what you are drinking) while tap water is. Manufacturing and shipping a bottle of water wastes 5 times as much as is in the bottle. Single use plastic bottles can leach BPA (Biphesenol a) which is a hormone disruptor in humans. While many bottles are recycled (actually downcycled), over 3 million bottles end up in landfills each day in California alone, and many more end up out at sea and in our rivers. I can go on and on, but seriously, do you really need more of a reason. Buy yourself a re-usable water bottle and say goodbye to single use plastic containers forever. Just a math correction -- $1 per bottle x 3 bottles per day x 300 days = $900 a year! Too funny and thank you for the heads up. I've probably used that example 100 times and there I go messing it up when i post it. No problem... and hey, if you use the example 100 times, does that make it $9000? Funny cuz i was actually thinking that as I wrote it. but how much water is wasted washing the cup? It's a great point anonymous, but I can assure you that it's much less than 5x, plus you don't have all the petroleum that was used in the bottle, the transporting of the bottles, the factory that made the bottles, etc. I live in a small Louisiana town (about 20,000) and our tap is horrible. Showers smell like fish, and we get notices at least once a year that our tap isn't meeting regulations, and to make sure and boil it. I generally only use city water for brushing my teeth and cooking. For normal drinking I buy bottled water; the cost of filters is excessive when they last less than a month. I'm just saying; there are some valid reasons for drinking bottled water. thanks for posting that and I apologize as there are obvious reasons for bottled water in some parts of the US and many parts of the world. My beef is actually with single serving single use bottles more than larger necessity needs. The filter thing is interesting as we have one that lasts a year (was here when we got here). I'll have to put some research into this and find out which ones are best for the cost and price them. In the interest of info do you mind me asking what your water costs are per month for bottled water? Wouldnt it just be easier, and maybe even better for the environment to buy one bottle of water made with good quality plastic, and maybe use that for a week or as long as we can keep it? I say this because if I buy an aluminum bottle I'll probably loose it in a month or less, and since its much more efficient to make 1 plastic bottle than to make 1 aluminum bottle, and you can use 52 plastic bottles a year or a lot less if you manage to keep them long enough, why dont we just go for that? Great honest question. As i see it, there are a couple of problems with your solution. For starters, since bottled water isn't regulated, you don't know what you are drinking. Also, the plastic is not intended to be used over and over so the bacteria and heat (sitting in the car etc) may break the plastic down - although within a week that may not be the case. Also, if you are concerned about losing a metal bottle than i'd assume the same would go for a plastic, in whihc case, it's most likely going to be landfilled (at best) which is no good. My two cents is to get a re-usable and train yourself not t lose it. How you ask? Get one, and tell yourself that you can't drink out of plastic anymore and if you lose it, you'll have to plunk down even more money to buy another one. Trust me, it won't take long. Bottom line is this all comes down to responsibility on a lot of levels and yes, it takes a bit of work, but once you have learned this new habit, it won't be any stress at all. My father and I have an age-old solution that works - burn everything so can so you don't need to take a trip into the landfill. I have a fire pit outside my house were I burn anything I can get my hands on so I don't have to waste my time taking it into the landfill. Over the weekend I burned an old sofa that was sitting around in the basement for years. The only problem you have to deal with is the massive amounts of smoke that is created. To avoid creating a scene I just burn everything when the wind is blowing in the right direction, or at night. This way nobody can see the smoke that is created (i.e. like that time I threw two old pairs of rubber boots in the fire...can you imagine the amount of black smoke that is given off?). If you burn everything you can you don't have to deal with recycling or even storing/transporting the garbage into the landfill. Remember...time is money! I posted your comment because I think it's good to have many sides to a coin (and you complimented my web building skills so thank you). That said, I'd be a little concerned about carcinogens being let off into the environment. That and the fact that I know a lot of people I wouldn't want building fires out there. I think if everyone did this we'd have some problems on our hands. My little opinion, improper open burning cause air pollution, it defeats the purpose of saving the Earth.. I love the our green Earth..
Really need to appreciate your efforts in creating this "eye opener" blogger. Kudos to you. Just need some knowledge here, I use bottled water whenever needed, I make sure I send the bottles out for recycling. I was wondering how many times can a plastic bottle be recycled ? 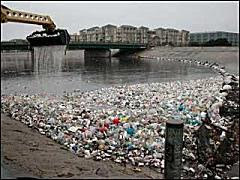 What happens to the plastic when recycled several times, does it degrade and expel more chemicals into the environment ? Also, can i make my life plastic free ? I know its difficult. Esp. when I buy products like Peanut butter in a plastic jar. Need your opinion on this one. Those bottles are downcycled, turned into lesser products like plastic boards and park benches. They use virgin plastic to make new bottles for FDA reasons. AS far as plastic free, it's tough but doable. You may have to make some hard choices though. Take it step by step and see where you can get. I just came upon your site, what you and your family are doing is a real eye opener...but this post about the water well hit home for me. I reside in upstate NY and we do not have town/city water or a well the water that comes out of the tap is rain catchment into a cistern...and one can call it grey water or just not good to drink. We have to buy water, we buy 4 gal. containers at a time at a cost of 4.79/container and we go through about 3-4/week there are 3 of us in the house and in the summer it is higher amount of bottles that we have to buy . We recyle as much as we can but the local transfer station will not take these bottle even though they have the right number embosed on them! A great point about how those of us with clean water take it for granted. IS a filtration system an option? In the long run you'd most liekly save money. I agree with the "idea" of NOT using water bottles. We don't prefer to drink our chlorinated/floride city water. In order to compromise between wanting to drink filtered water, I use a Culligan 3 gallon container and refill at the grocery store in Wisconsin for 39 cents a gallon. My husband like the individual bottles but agrees with reducing waste and as long as I keep a few filled stainless steel bottles available for him and our kids for after soccer/karate, it is our compromise. I am tired however of hauling water and am saving up my money to purchase a Royal Berkey Stainless Water filter system. 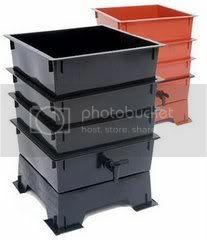 They run around $350 for the stand alone unit(ebay too) but the filters/elements are reusable by just cleaning them. I figure in the long run that will save me money. Many of the ebay auctions include water bottles. You asked"IS a filtration system an option? In the long run you'd most liekly save money" We would have to redo the total plumbing in the house as well as a filtration system a simple pur would not kill or filtrat what is in this water. There are companies out there that have ground water to drinking water but they are not avilable in the US only to 3rd world countries..
Wow, so sorry to hear that. Have you tried contacting your local reps? I'm sure I'm not suggetsing anything new but in the US there should be no excuse for people not having access to clean drinking water in their houses. Just discovered your blog through a building French magazine (e-newsletter). You are creating a courageous awareness to your own US citizens. I lived in the US and noticed that wastes would be a concern in the future, as it is here as well. Back to Sara's comments, there are systems that can make a well or surface water (i.e. lake) into a fully potable water. They are not really cheap but work out very well, and are not only reserved to 3rd countries. They are actually manufactured in N. America. To Earthmomma: Watch out for the "rinceable filters" that have only the name and not the real feature. Never try those on really infected water. IN summaru you're safe as long your feed water and your health are in good conditions...otherwise, you'll find out the hard way. In defense of the "readily available" idea, where you state that tap water is more readily available than bottled water, I would have to disagree with you in some instances. Personally, I try to take a water bottle with me to work every day, however, before noon, it's empty. It's already a decently-sized bottle, and if I brought more than one, it would be pretty cumbersome (one is already adding a pain to carry). I could just fill it up at the faucets at work, but most of them are disgusting enough that I'm barely willing to put my hands under that water, nevermind drink it. However, for only one dollar, I can get half a liter of water in a plastic bottle. I recently took a four-day car trip (in my hybrid), and was rarely able to find faucets expelling water I'd be willing to drink. And finally, I've yet to find a light, easy-to-carry water bottle that was not prone to leaking. Either the seals are good for a week and then begin to leak (all over my work papers!) or the seal stays night and tight, but require effort to unseal, making it inconvenient for a sip of water. So while I agree that people need to stop using plastic bottles, I believe you've dismissed the "convenient" argument out of hand. Thanks for the note. Of course there are instances that are not conducive and while I don't thnk I dismissed these out of hand, i do think they are more rare than not in this country. I've gone on car trips and been fine filling up in all sorts of places, sometimes having to do a little thinking. As for filling up from questionable taps and the good bottle problem, I've had an ecouable and a sigg and both have never leaked. I prefer the eco as I ike the steel better than aluminum and they are not hard to open. In addition, ecousables now sells a water bottle with a built in carbon filter that has been independently tested to remove pretty much everything but microbial bugs. So that would make it much easiuer all around. I thnk the answers re out there, they just need to be expored. Thanks for continuing to push. Metallic taste gone after first few uses but water smell bad after 4 to 5 hours. Anyone with similar experience?...and also I appreciate your thoughts. 1. Where are you located? I wonder if your specific water supply may react with the stainless? 2. Have you washed your bottle with warm/hot soapy water along with either white distilled vinegar or baking soda to truly sanitize the bottle? You should do this before 1st use and every week or two to give it a neutral taste. We hope this helps! Feel free to contact me Katharine@EcoUsable.com if you have further questions about the bottles! I think plastic water bottle should ban. or people stop using these bottles. I'm not a fan of water bottles but seriously doubt if someone drank bottled water daily they wouldn't actually pay $1 a bottle when I see you can get a case of 24 for about $4. I was talking about buying them on the street which a lot of people seem to do but even at the .60 price point you mention, tap is cheaper. And then there are all the other negatives. Folks don't like being ripped off so I think the monetary aspect is a good one to point out. your blog is a real inspiration. I will write about you in my thesis! I live in Romania and it's quite hard to be eco here, but I returned from the States with a camelback recipient, made of plastic, but BPA free. I hope it lasts at least a year. Is this kind of plastic ok or is this worse than normal water-bottle-plastic? All the best and once again, congratulations! So, here's the question, I had been using Nalgene bottles up until the whole BPA thing broke loose, and now I have all these bottles sitting here. Plus the bottles that came w/ my breast pump also had BPA... I am now using plastic bottles that are BPA free mainly because they were available quickly when I needed them vs. searching for aluminium or stainless which will replace the plastic ones as needed. Tough question as Im sure you don't wnat anyone else using them. I'd go for the repurpose. IS there a use for them around the house? Otherwise you may want to try a local art school, elementary school (for storage only) or maybe even freecycle them to a local artist. You'd be surprised what some of them will use. rachelb - I put one of my Nalgene bottles, filled with water, in my toilet tank to make it a low-flow toilet. Gracias por la información, conoceis algun tipo de filtro de agua sencillo y casero. Saludos y gracias desde Ecología Activa. What sort of things could be put in our bottled water that are harmful since it is not regulated? It's not what they would put into it, it's what kind of impurities may be in it that aren't being looked for. The bottles if lweft in the sun can leach all sorts of chemicals including BPA. Tap water can contain just about anything depending on where it comes from including methane, butane, and beyond. I have to find the link but the NRDC did a study of bottled water and about 20% tested positive for known carcinogens. Because no one is testing the water, we have no way of knowing what we are getting. What if you are very forgetful and continually lose the metal bottles wouldn't be cheaper than to use plastic bottles that way if you lose it it is only like a dollar being wasted and if you don't lose than you can just reuse that bottle. no disrespect to you though. No disrespect taken Dennis. I guess it's just a question of being responsible. Im assuming you don't lose your wallet, or your pants at the very least. Why? Because these things are important enough for you to make certain to keep check on them. If you decide that stopping plastic bottles is important enough, and refuse to use them, you'll end up training yourself to not lose the bottle. At least that's what ive found. If it's important enough people always find a way. I don't know if you were aware, but there are now biodegradable water bottles. I was pretty excited when I found out! Check out Earth Spring Water at www.earthspringwater.com. The guys who own it are a couple of health nuts. I have actually just recently stopped buying bottled water every morning for school. It has helped me save a lot of money already. instead of buying a bottle and reusing it( which i know is not the healthiest thing to do), I use a BPA free portable, plastic water bottle. It even has the words reduce, reuse and recycle on it. Ironically the bottle is also green. I have found that it is more convenient to fill the bottle up than to go buy one everyday. Wow, those are some interesting facts about plastic bottles that I had no idea of. Who knew all that money was coming to a waste with buying these products. I will take a better approach from now on when buying these plastic bottles. Thanks. Im a student at white oak high school and north carolina. Ive been following your blog and I think it is quite amazing what you have been doing. I really never noticed how much plastic harms the environment. I buy water bottles all the time, I guess I buy them because its cheap and convienent. Also the water has already been filtered. But i recently found out that there are water tin bottles that have a filter through the straw I just want you to know that I am informed about what something as simple as a water bottle can do the the environment and I will try to change my bad habits. Thanks for informing people. You are making a change. Thanks Kim, always appreciate positive feedback, but the only way I can make a change is if you do, and it sounds like you are on your way. Those filtered bottles are great, just wash them well or you'll get a weird taste right off the bat. Check back in and let me know how it goes, and most importantly, spread the word! I never really noticed how much plastic i waste by all the water bottles i drink until i seen the calculations. It makes me wanna make a differance and let everyone know. This article was very interesting to me. Personally I knew that using water bottles is very harmful to the environment and that is why I have been using a reuseable water bottle for years. But this article brought up something that I and probably many others have never thought about and that is that you are actually saving money by using a reuseable water bottle. I know now that if I am ever trying to convince someone to switch to a reuseable water bottle that I will bring up this point.